Hang on to your dreams! I just read a really great article about David Copperfield in Hello! Magazine. It made me think of my clients who are are new dental practice owners, or considering ownership. Although the article is about Copperfield’s Caribbean home and his recent engagement, the part that really grabbed me was when he spoke about his dreams and his parents.When Copperfield was a young boy, his interest in the magician’s arts was becoming more than a hobby and his parents feared it was an obsession that would prevent him from choosing a ‘real’ career. At one point, young David grew so frustrated with his parent’s nagging that he tossed all his magic plans and materials into the trash! He decided that since everyone was telling him to forget about his dream of being a magician, that he would just quit. He went to bed that night overwhelmed and cried himself to sleep. When he woke, all his previously turfed plans, drawing and blueprints were spread around him on his bed. His father (who himself had abandoned a dream of having an acting career in favour of opening a men’s wear shop in New Jersey) had left him a note. It said, “A dream means doing the impossible”. Wow! Hang onto your dreams and don’t let anyone sway you from your passion. 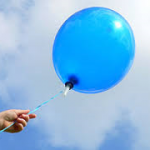 Clutch it in your hand like it’s a helium balloon – if you let go, it will fly away from you and it will be no more than a speck in the sky, too far for you to reach. PreviousPrevious post:What comes after the convention?NextNext post:It’s Just Stuff!